Earn $1.29 in Rewards credit. Click to learn more. Treat your road or mountain bike to a fresh set of cables and housing. 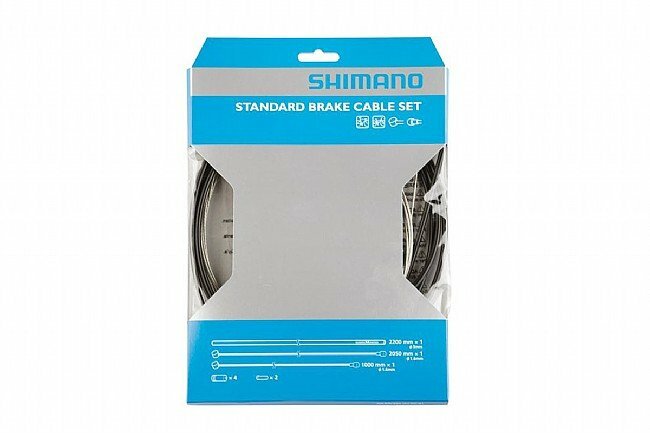 The Standard Brake Cable Set includes two double ended stainless cables for use with road or MTB brake levers, a single length of housing and a compliment of ferrules and end caps. Available in Black only. 183g. Didn't know you needed to change brake cables. THought you just let some silicon spray slide down into the cable housing. Had a training buddy test ride my bike after new wheels were installed. Let me know my brake cables needed replacement. I usually go to a mechanic to do all my bike maintenance. He said I could do it myself. I bought these and the installation was VERY easy. And now, so is my braking. Looking at doing this to my other bikes soon since it was so easy and I felt such a great improvement. More than enough cable for front and rear avid disks. Switched my commuter to avid bb7. More than enough cable provided to do the job for both front and rear. Really satisfied. What more can I say? These are brake cables. They work. Good quality. All the goodies you need in one package. Cheaper than if you went into a bike shop and they cut you pieces of cable and housing. Works great. Much better than my old cables. One of the most basic components. I probably should have replaced them sooner. There is a noticable difference in the ease of braking.